Africa’s most populous nation is surely in need of a new vision, and many challenges face President Goodluck Jonathan, who after the recent elections is currently negotiating the difficult task of assembling a cabinet and government that can embrace all Nigeria’s cultural, religious and ethnic diversity. That work has been made even more difficult by both human and natural disasters, including a recent outbreak of terrorist bombing in Abuja and the North, and widespread flooding in Lagos, the former capital and biggest city. 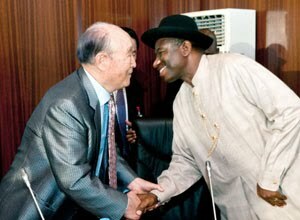 Father Moon shares a warm greeting with Nigerian President, Dr. Goodluck Jonathan. 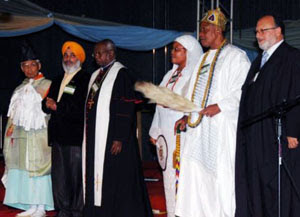 Leaders of six faiths offer prayers of peace to open the Peace Tour program in Abuja. Despite all this turmoil, President Jonathan had earlier taken scarce time away from his other duties to for a substantive meeting with Father and Mother Moon and members of their family and tour party. During this time together, Dr. Moon offered the President three suggestions for the future of Nigeria. First, he strongly urged President Jonathan to honor God and God’s laws and traditions at the center of his government, and to channel Nigeria’s national passion for religion an asset for peace instead of a source of division. Next, he emphasized the importance of supporting strong marriages and families, so that Nigeria’s traditional families are not eroded by a tide of secular and humanistic values threatening to sweep the country. Finally, he voiced the hope that Nigeria will emerge as a model nation for all of Africa, and for the world. 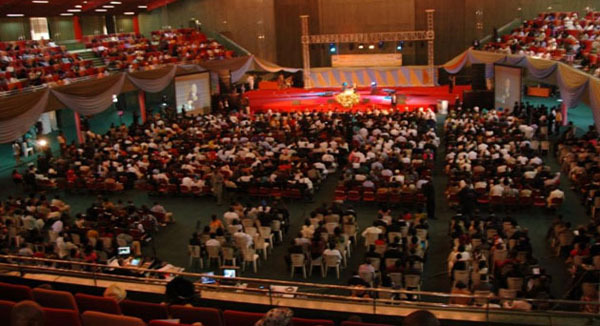 These three themes formed the focus of a three-day International Leadership Conference hosted by the Universal Peace Federation, drawing more than 700 participants from Nigeria and 69 other nations. A total of 34 speakers addressed topics such as agriculture and food; health and development; interfaith peacebuilding; and good governance. 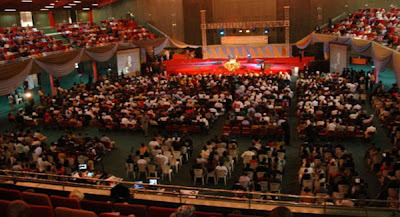 At the opening plenary of the UPF Conference, Dr. Thomas Walsh, UPF President, said that the leadership conference and the peace tour demonstrated the “commitment of UPF in Nigeria and Africa at large to promote interfaith cooperation, good governance, strong marriage and family, and character education for youth." 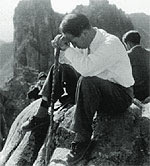 UPF International Chairman Rev. Hyung Jin Moon delivers the conference keynote address. Former Prime Minister of Togo, Gabriel Messan Kodjo, addresses the Opening Plenary. 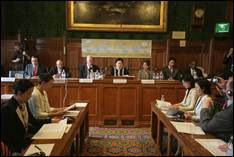 Dr. Hyung Jin Moon, UPF International Chairman, said that true and lasting peace cannot come from a secular, human origin. “Lasting solutions to the critical problems faced by the people of this region call for a spiritual awakening and the full participation of those who affirm and practice spiritual principles,” he said. People signing up for tickets to the main program. 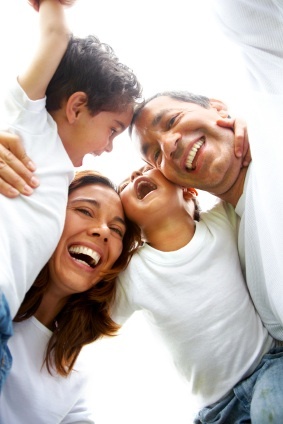 At last, Father and Mother Moon came to the stage, introduced by two of their children, Rev. 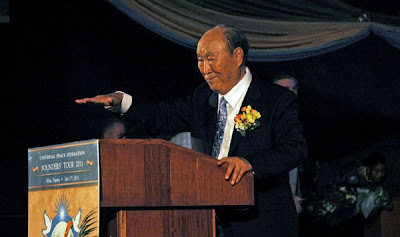 In Jin Moon, the Senior Pastor of the Unification Church of America, and Rev. Hyung Jin Moon. 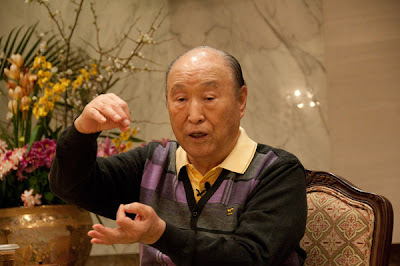 Father Moon describes a vision of peace for Nigeria based on stable families that love God.